We recently overheard a small child asking her mother, ‘Why do we call it the “living room” because we live in the kitchen?” That got us thinking about the changing role of the kitchen in our lives and how this room relates to our attitudes to food, family, friends and life in general. The kitchen has come a long way. Kitchens were once entirely functional spaces, the preserve of the servants or somewhere for the woman of the house to come and prepare food. Often they were little more than a cupboard or a cluster of little rooms; scullery, larder, pantry – places where hard, messy work was undertaken in hot, steamy conditions. Absolutely the last place you’d want to spend unnecessary time or to bring friends and family. This all began to change during the post-war boom. The Fifties and Sixties saw the emergence of the fitted kitchen. These were designed to make housewives’ lives easier and, for the first time, to look stylish. Now homeowners were willing to devote more space to this room and spend more time there so that they could enjoy their huge investment. Homeowners began showing off to friends over morning coffee and started eating family meals around the kitchen table for convenience. Gradually the dining room began to feel obsolete and irrelevant to modern living and was often scrapped completely. In recent years the kitchen has begun to encompass the duties of a living room too, with the addition of comfy chairs and sofas. 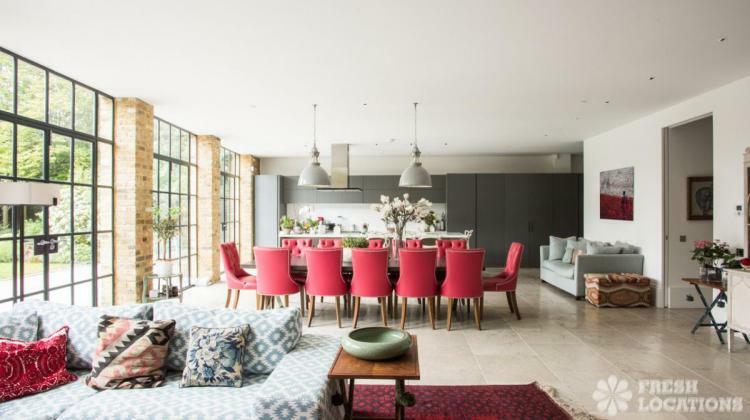 The often prohibitive costs of moving, especially in big cities like London have seen kitchen extensions becoming de rigueur and they are a popular feature of many of our location houses. Our modern obsession with light and space means that these new rooms generally include floor-to-ceiling glass windows opening onto the garden, a space which is often cleverly linked to the house by use of similar furniture or materials – such as a polished concrete floor that continues from kitchen to terrace. So the kitchen has taken over the garden too. This is a look that we are seeing time and again with the houses registered with our location agency – and it is extremely popular for both filming and photo shoots. So the kitchen is gradually taking over. All we tend to be left with is a separate living room at the front of the house, with many homeowners admitting that this is an under-used space, often the place the grown ups retreat to on a winter’s night to catch up on the box sets. Perhaps this living room would be better rebranded the sitting room, the snug or the media room. Many of these changes stem from our developing interest in food. In the last decade there has been a huge increase in our appetite (sorry) for food TV shows, magazines and blogs. Who could have predicted that shows like the Great British Bake Off would become the mainstays of our water cooler chats. And through the steady drip-drip of all this food media we have discovered a lot about what we eat. We have learned to prize fresh, seasonal, local and organic ingredients and to put them at the heart of our cooking. It’s not just the media that has influenced us. We are now better travelled and are much more savvy about dishes and ingredients from all over the world. And with the rise of farmer’s markets and street foods we’re able to sample so much more fresh and inspiring food and take home a whole bunch of new ideas. Food has become a leisure activity and cooking an expression of our creativity – something we actively seek to devote time to. When we’re spending time in the kitchen we naturally want our partners, children or friends around us so it’s no surprise that our kitchens have grown to accommodate them. In many of our location houses, the kitchen is the largest room in house. Our family relationships have changed too. Where once children were seen and not heard, parents are now work longer hours so, when we are at home, we prefer to be together. A large and multi-functional kitchen allows us to cook, eat, lounge, work, and play in one versatile shared space. Likewise, as the largest and most important space in the house, it’s the obvious place to spend time with friends. Because cooking has become so important, we don’t want to wait until we sit down to eat for the socialising to begun. These days we much prefer to congregate in the kitchen, cooking and chatting together. Friends, family, food and fun – this surely is living, so perhaps it is time we rebranded the kitchen as the new living room. This room embodies the modern day kitchen. With ample space devoted to cooking, eating and living, it feels relaxed but also makes a strong design statement with its mix of black and white and its use of natural materials like marble and wood. This kitchen is packed with personality and its success lies in the mix. We love the combination of the plaster-pink walls and the shiny metro tiles with the industrial-style features like the exposed beams and brickwork. A cool kitchen in every sense, from its simple use of concrete – which runs along counters and makes a feature of the extractor hood – to the bold turquoise of the sofa and armchair. The owners of this location house have created a stunning room but also a calming space in which to unwind. This kitchen is a great example of the ‘new country’ style – relaxed and utilitarian but still full of charm – from the opalescent tiles to the recycled drawer fronts. It’s the kind of room we feel instantly at home in. This funky kitchen proves that family life and modern style are thoroughly compatible. We love the bold pops of tomato red and lemon yellow, bouncing off the slick white units and worktops. This kitchen is calm elegance embodied. We love the warm grey colour that the location house owners have chosen for the minimalist cabinetry. The bank of bronzed wall cabinets create an almost sculptural element and provide the perfect backdrop to the trio of simple industrial lights that hang above the island.